Mostly success… and a recipe! Well, lately I have been having a mix of success and failure in my attempts at self-improvement. Firstly, I have eaten many clean meals and I’ve even been exercising. Sadly, I worked out so hard on Monday that I chose only a mild walk Tuesday morning and have been so sore I haven’t done anything since. Hopefully I recover by Friday and I can do some workouts this weekend. So, I’ve been trying to watch what I eat and have been adequately successful except for a sliver of cheese cake yesterday (horrible, I know!) and some Costco pizza (even worse!). For those of you who frequent Costco (especially their food court), please check out this website and follow the PDF link to see the nutritional information. It shocked me at first and (until yesterday) I haven’t eaten there since. Unfortunately, I haven’t learned to navigate a social gathering’s buffet table. But, overall, I’m voting it a job well done which is hard for me to say and harder to write because I am, naturally, a negative person. And believe me… I kicked myself hard for it! But looking at all the pictures of the good, clean food I DID eat, it is hard to say I haven’t been successful. 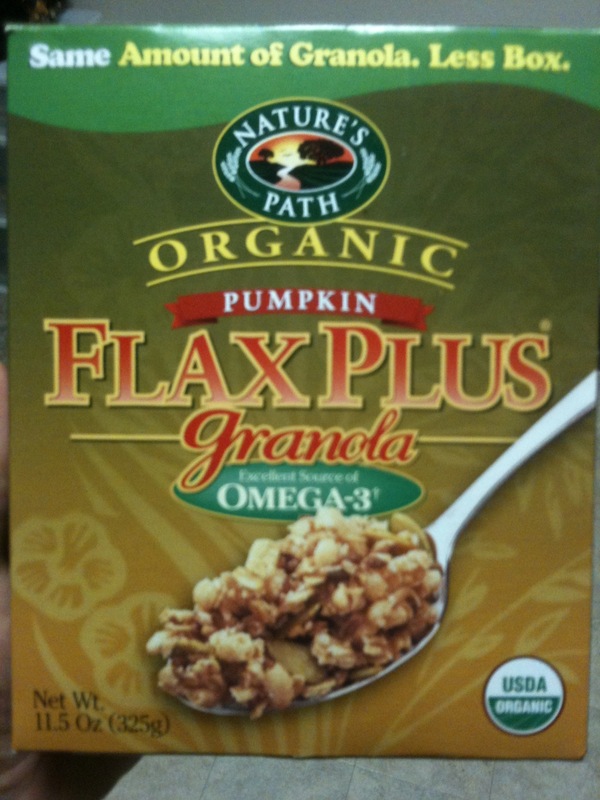 It wasn’t bad, but I think I prefer my Kashi Autumn Harvest. 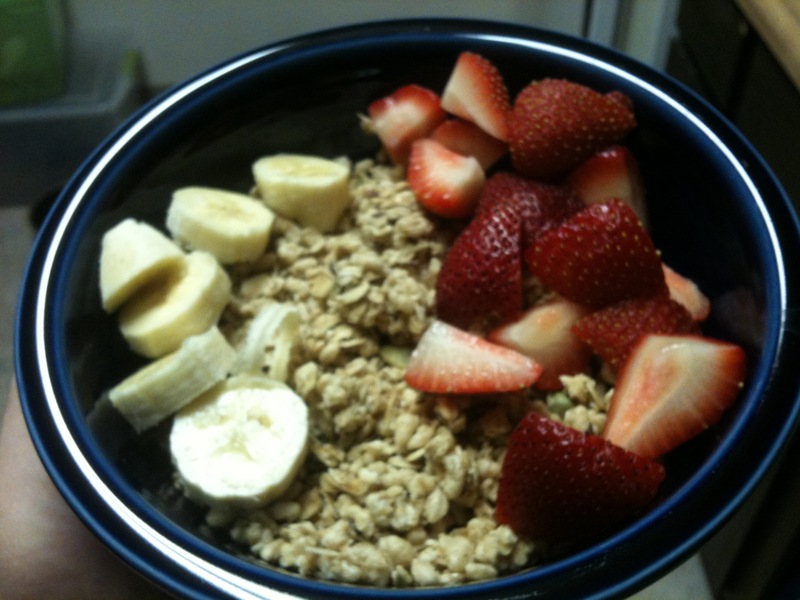 I topped it off with banana and strawberries and a delicious cup of Kaladi Brothers coffee! Eating breakfast like this really has made a difference in the way I feel everyday. I now drink less coffee, more water and I’m not tired from the minute I wake up. 1: heat oil in Dutch oven (really big frying pan?) over med. heat. Add cummin through chili powder and heat until fragrant. 2: add chopped onions; cook until soft. Add garlic; cook 1 more minute. 3: add cooked rice, beans, stock, chipotles, tomato paste and salt. Mix well, reduce heat and simmer for 20 minutes. So, I didn’t have chipotles, coriander OR chili powder so I nixed the coriander and subbed cayenne pepper for chili powder and Tabasco sauce for the chipotles. 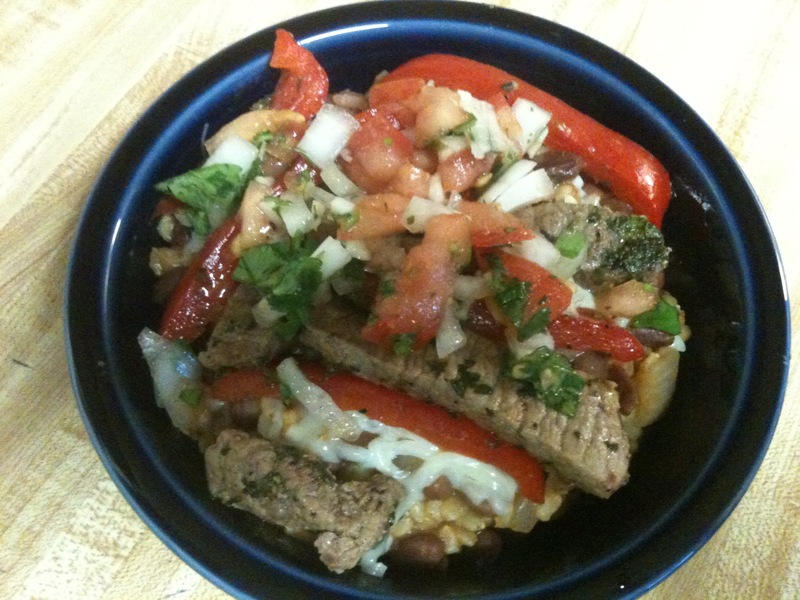 Also, I used small red beans instead of pinto (I hate pinto beans!). On top I fried some steak meat and red pepper in garlic, pepper and cilantro and served that over top with a fresh pico de gallo. Overall, a little mellow at first, spicy near the end and oh so delicious! The recipe was modified from The Eat Clean Diet Cookbook, pg. 354. Also, I have been thinking about posting my weights and measurements soon so that I can better track my progress. My last weigh in was 220 lbs and hopefully I have lost something. But if nothing else, eating healthy and drinking lots of water (more water info in later posts) has leveled my moods and made me a much calmer and self-confident individual. Ahhhh the power of FOOD! And for the question of the post: What foods in your life are your vice (the ones you can’t “live” without)? For me, it’s chips and pizza. So I decided healthier chips dipped in salsa (veggies in disguise) and I try to “clean” my pizza as much as possible! And now, off to bed!